Camden Maine harbor view from atop Mount Battie. Camden and Rockport are the diamonds of the Midcoast. They experience a serious influx of affluent summer visitors. It is like that every year with no variations, and it will probably be like that forever. Lincolnville, which lies to the northeast of these two Old Money resort meccas, is a separate town, but it functions more like a hip and happening suburb of Camden. It is less traveled than its Midcoast sisters, but people in the know (locals) tend to flock to its sandy beach as well a place known as the Ducktrap, a rocky piece of shoreline that exists where the Ducktrap River flows into Penobscot Bay. In other words, when you visit this section of the Maine coast, you can have the best of both worlds: a busy and vibrant resort community and an off-the-beaten path hideaway. You just have to know where to look and when to go. Over the years, Hollywood has filmed a handful of movies in the Camden area. From films like Casper and Mel Gibson’s The Man Without a Face to In the Bedroom, a dark domestic tale based on a short story by Andre Dubus, the late Massachusetts writer, Camden has provided the silver screen with a stunning backdrop. When you drive through the picturesque downtown and see the colonial revival mansions on high street, which overlooks the glittering harbor, you cannot help but notice how visually pristine, immaculate and picture-perfect the town really is. It was as though the entire place was specifically designed and staged as a classic New England movie set. You wonder if the canary-yellow sun is artificially powered or if somebody just painted the sky a deeper shade of blue. Of course, with that type of mise en scene beauty comes hordes of tourists and like almost all of coastal Maine, Camden’s yearly population of 5000 quadruples during the summer months. Shirts and shoes might not be required, but patience certainly is. The sea is Camden’s bread and butter, and the harbor is always awash in colorful boats. From dinghies and cutters to ostentatious yachts and windjammers, Camden rivals Boothbay Harbor as the sailing capital of Maine. However, people descend on Camden for a variety of recreational reasons, and there is something in the air that says: Camden is a Life of Leisure. History, performing arts and a wealth of outdoor entertainment is what makes this area a vacation hotspot. You can spend the day hiking or kayaking in Camden Hills State Park, and then put on your khakis and Oxford shirt for a cultured night on the town by taking in a concert at Camden Opera House. Museums and historic houses are a dime a dozen in Camden. The Walsh History Center, Conway House Museum, Mary Meeker Museum and Edna St. Vincent Millay archives will all help you tap into your inner Harvard scholar (you cannot spend every day sunbathing on the deck of the boat, right?). Camden even has its own ski resort. A popular draw in the winter, the Camden Snow Bowl is a small, community-run ski area. In the summer, it is an ideal place to hike and bike. Fun fact: There is a monument in Rockport’s Marine Park to Andre the Seal. This beloved seal used to swim up from the Boston area every summer. He would jump through hoops and shoot baskets all summer long before departing, just like the hordes of summer tourists, when Labor Day approached. It is said that Andre was killed on his way to Rockport in 1986. Less touristy than Camden, Rockport still attracts a rush of summercators. However, there are far less traditional tourist activities in this hamlet-by-the-sea. The small, brick-lined downtown quickly fades into miles of rural summer homes and cottages. Capes, shingle-style and nouveau palaces dot the landscape. The Rockport Opera house sits on a hill with a stunning view of the harbor. It holds Bay Chamber Concerts throughout the summer. The Maine Media Workshops, which is a film and photography school, has brought a lot of big names to the area. The Center for Maine Contemporary Art can also be found here. Rounding out your To Do List: If history is your forte, then pay a visit to the Camden Area History Center and the Camden-Rockport Historical Society. If you are more the outdoorsy type, then check out Aldermere Farm, the Maine Coast Heritage Trust and the Indian Island Lighthouse. Technically speaking, Lincolnville is divided into two sections: Lincolnville Center and Lincolnville Beach. If you are looking for the good life, which includes trendy shops, upmarket galleries, vintage craft shops and friendly and laid-back watering holes like the Whale’s Tooth Pub, then pull up a stool in Lincolnville Beach. This is also where you can access the ferry to Islesboro. Lincolnville is a tiny area, so if you blink your eyes it is going to pass you by. Then again, you might just assume you are still in Camden or Rockport. Sandy Beach is a must-see. Otherwise known as French’s Beach, it is a local hangout, but chances are the locals will not chase you off their patch of sand like the surfers do in Hawaii. The Strawberry Festival is held every year in Lincolnville. While Camden, Rockport and Lincolnville are the areas sightseeing trifecta, there are other scenic communities that are worth exploring. Besides, after wrangling Camden’s notorious traffic (both in the car and on foot) a breath of less congested air might be a good idea. Believe it or not, Maine has several high-profile vineyards and wineries. The Savage Oaks Winery is located on the nearby 1790s Levis Morse Farm. However, before you taste test some whites, red or fruit blends, take a scenic drive through Union, Hope and Appleton. These small and undiscovered bucolic towns are the perfect remedy to Camden’s Grand Central Station type atmosphere. Once you are clogged in traffic in downtown Camden and watch as a tourist in the car in front of you shaves in his rearview mirror with an electric razor, you know that a day trip from the summer madness in is order. Beautiful Penobscot Bay and Camden’s surrounding geography guarantee that any accommodation you find in the area is bound to have breathtaking views. 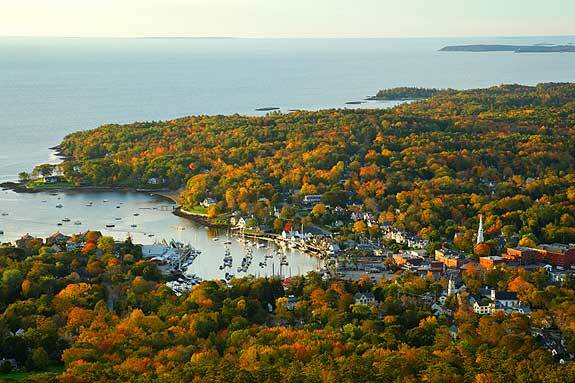 This area of Maine is bursting with all sorts of historic inns, B&Bs and shore cottages. However, do not expect to head to Camden in the summertime without a reservation. Even accommodations in satellite towns like Lincolnville fill up quickly. Spontaneity is a wonderful life choice, but in Camden it will not pay off. If you want to stay at that Mansard-roofed Victorian inn on the sea ledge, call at least six months in advance. The culinary options in Camden and the surrounding area are plentiful, but tend to run on the expensive side. While casual taverns, steakhouses and bistros serve up designer lunch fair (coconut shrimp, mussels marinara and Prosciutto Crudo pizza) in the evening, Camden goes full-tilt master chef. However, similar to many coastal places in Maine, you are paying for the incredible waterfront view as well as your lobster with squid ink. There are a handful of sought after and highly respected dinning spots in Camden. There are Prix-fixe menus that feature seasonal ingredients (Menu Saisonnier) and an emphasis on French-America fusion. Venison, charcuterie, salmon tartare, foi gras and other European bistro style fare are also popular. Raw bars are plentiful. The dining in Camden can be as ostentatious as the yachts in the harbor. Good luck trying to find a simple burger. Visit the following directories to find lodging, dining, attractions, shops, services and recreational activities in the Camden, Maine area.